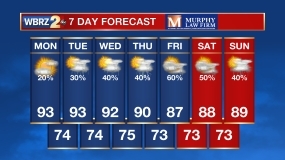 WATCH: Click here for live weather update. A cold front will push southward through the Baton Rouge area and into the Gulf of Mexico on Tuesday. As temperatures plummet, isolated, light rain showers will transition to snow and sleet. Bitter cold will follow. 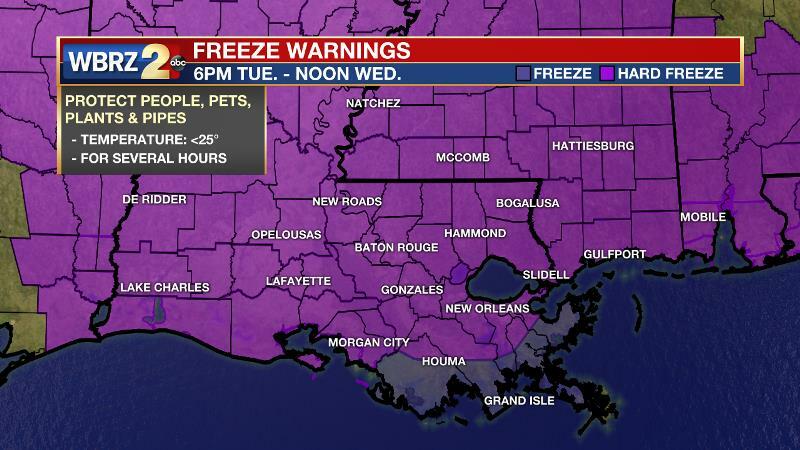 Wintry Blast: On Tuesday, thermometers will fall through the 30s during the day, reaching freezing by early afternoon north of Baton Rouge, mid-afternoon in the city and dusk along and south of I-10. Precipitation output is expected to decrease as a cold front nears the Gulf of Mexico. However, enough will remain that light rain showers are anticipated to begin around midday and as the temperature drops it will transition over to frozen precipitation—snow, sleet and freezing rain. Given the isolated and light nature of the precipitation, it is important to note that impacts are expected to be low. Regardless, a WINTER WEATHER ADVISORY is posted until midnight as some patchy icy spots may develop as the temperature drops below freezing. Use caution when driving after dusk especially. The most susceptible areas will be elevated surfaces and more lightly traveled roads. 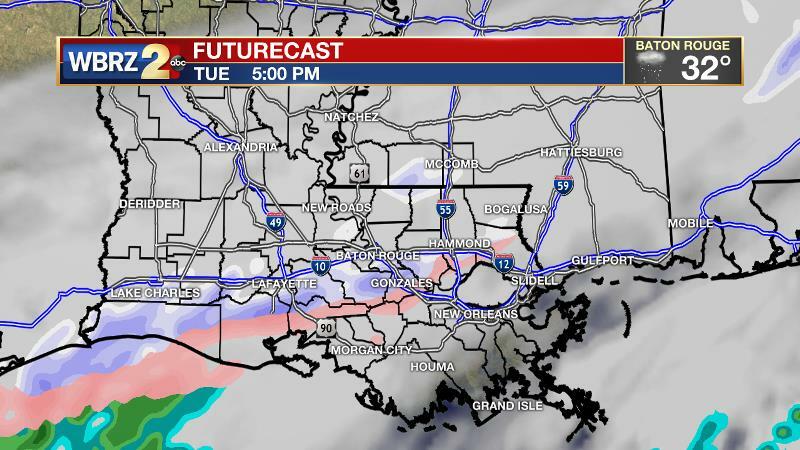 As usual, the best chance of seeing any snow or sleet accumulate will be in southwest Mississippi and neighboring Louisiana parishes such as Pointe Coupee, West Feliciana and East Feliciana, where the cold air arrives earliest. Up to one inch is possible for these locations. At maximum, a coating to a half an inch is possible for areas along and south of I-10/12. Any wintry precipitation is expected to shut down by about 8pm. Perhaps the greater threat from this event will be dangerous cold. Low temperatures will tumble all the way into the upper teens by Wednesday morning. For this reason, a HARD FREEZE WARNING has been issued by the National Weather Service. This means temperatures will be below 25 degrees for several hours. 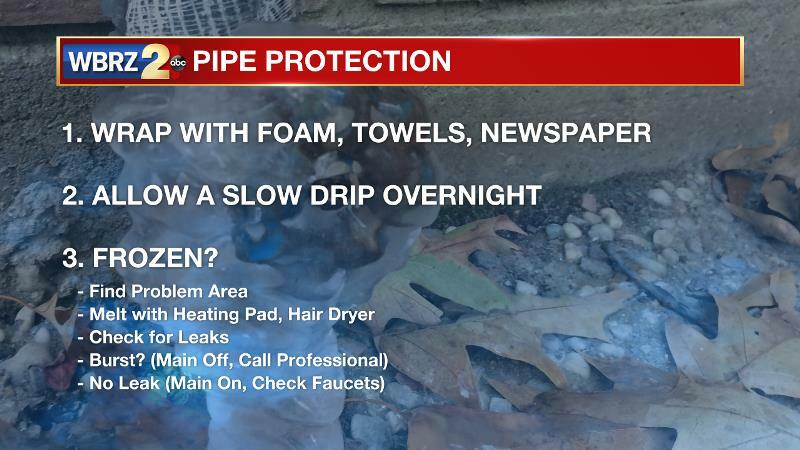 As the next two night may be even colder than January 1 and 2, even if pipes did not burst then, you might take additional precautions this time. If you are unsure of what to do, we would always recommend consulting a licensed pro. Last but not least, with north winds of 10-15mph, biting wind chills will produce feels like temperatures in the single digits. It is paramount that you cover as much exposed skin as possible and wear multiple, loose layers in these temperatures to prevent frostbite. It would be a good idea to wait with kids in the car at the bus stop to avoid leaving them in the cold. Additionally, try and provide a warm place for all pets and also livestock if possible. Especially with domesticated animals, keep in mind that if you are cold, they are cold. A WIND CHILL ADVISORY has been issued by the National Weather Service to account for feels like temperatures in the single digits on Wednesday morning. Up Next: Unlike the cold stretch in early January, this spell will be shorter lived. By Friday, high temperatures will return to the upper 50s. Saturday morning will be above freezing followed by a mostly cloudy afternoon in the upper 60s. On Sunday, thermometers may reach the 70s with a chance of showers and thunderstorms as another cold front moves through. Temperatures will not be nearly as cold on the other side of that one. 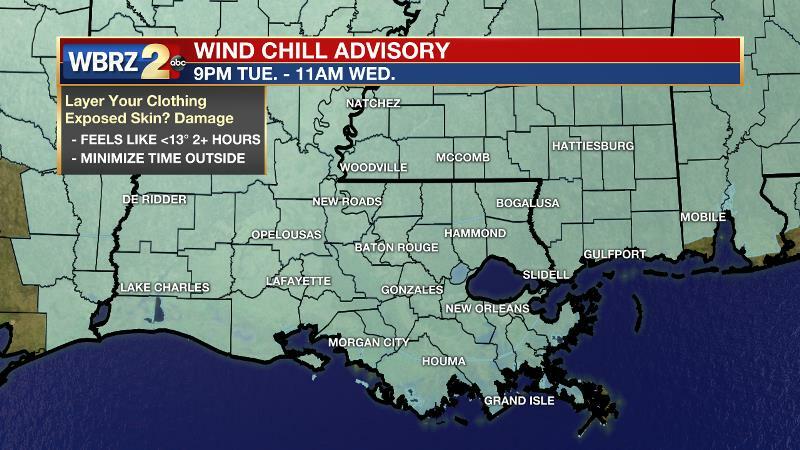 A strong arctic cold front will push across the Baton Rouge area during the morning hours. Prior to the front, as expected, temperatures actually climbed into the upper 30s and low 40s. This increases confidence that any initial precipitation will fall as rain. By mid to late afternoon, liquid will transition over to frozen precipitation in the form of snow and sleet, occurring first north of I-10/12 and then south. Because the front is expected to be losing moisture as it approaches the area, precipitation will be light and isolated. For this reason, the forecast reflects light wintry precipitation accumulations of a coating, and at maximum, up to an inch in southwest Mississippi and adjacent Louisiana parishes. However, any precipitation that does fall will be susceptible to quickly freezing and creating patches of black ice, primarily on bridges and overpasses. Overnight, temperatures will bottom out in the low 20s and teens achieving a hard freeze all the way to the southshore of New Orleans. North winds of 10-15mph will create single digit wind chills. It is very important to take care of people and pets without access to heat over the next two nights. Additionally, even if your pipes did not burst in early January, this stretch will be colder so take the necessary precautions. The heart of the upper level cold pool will park over the forecast area Wednesday preventing high temperatures from escaping the 30s. Wind chills will remain in the 20s through the day. Fortunately, wind will decrease Wednesday night and while another hard freeze will occur, the wind chills will not be as severe. A zonal flow in the upper levels will return by Thursday allowing the coldest air to retreat northeast. Temperatures will respond by moderating into the 40s before one more light freeze occurs on Friday morning. A weakening shortwave trough will then push across the region on Friday night but due to continued dry air in the low levels of the atmosphere only increased cloudiness is anticipated. Temperature moderation will continue though with Friday highs in the upper 50s followed by above freezing temperatures on Saturday morning and then a high in the upper 60s. The arrival of some low level moisture by Saturday may allow an isolated shower to develop, but that is all. As the lower levels continue to saturate due to warm southerly winds being transported over cooler bodies of water, fog formation will be likely into Sunday morning. Yet another shortwave trough advancing from west to east across there country will lead to positive vorticity advection on Sunday causing the fog to dissipate but also instability to increase. Due to this and an associated cold front, showers and thunderstorms will develop on Sunday afternoon and evening. There may also be enough wind shear available that this environment will need to be monitored for the potential of stronger thunderstorms. Temperature will fall only modestly behind that front with seasonable readings into next week.